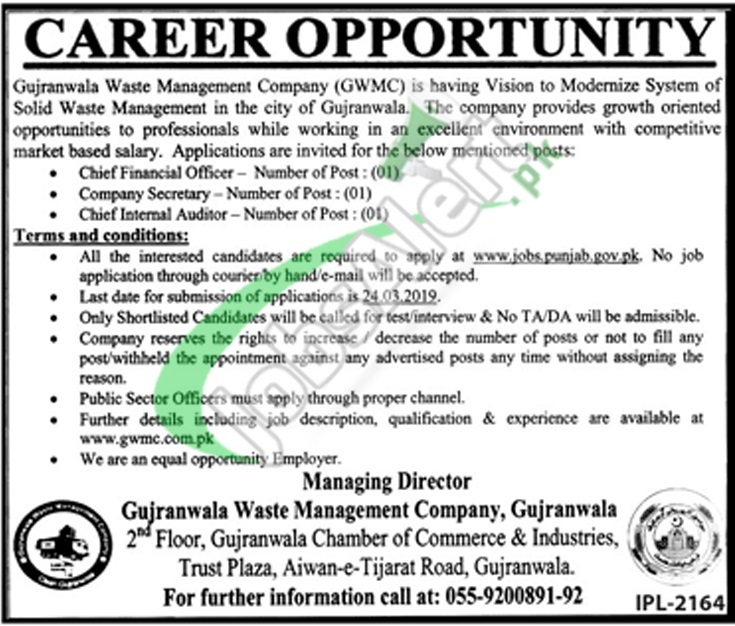 Tap this page for the GWMC Jobs 2019 Gujranwala Waste Management Company Latest Advertisement announced for the highly qualified and experienced individuals who are welcome to apply for the following vacancies. Jobs in Gujranwala Waste Management Company are such as (Chief Financial Officer, Company Secretary, Chief Internal Auditor). These postions are on contract basis which is extendable. Candidates possessing qualification from Masters / CA / ACCA / ACMA and relevant field experience holders are welcome to apply via online at www.jobs.punjab.gov.pk before the last date 24th March 2019.